Now you can harness of the power of colossal graphics to tell your story. This VersaWall System trade show exhibit features continuous graphics that span flat wall surfaces unbroken by exposed extrusion. Surround visitors with your brand so they experience it in a fresh and contemporary space. Our slim profile extrusion accepts both SEG dye sub fabric and rigid infill graphic panels. 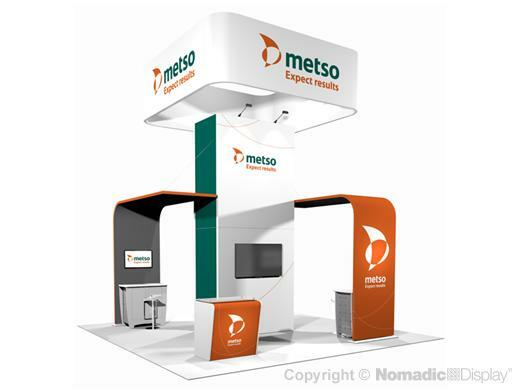 This trade show display features hanging structure for overhead branding, wallkin storage, Media Workstations for presentations and seemless graphic impact. Contemporary in style yet practical, our trade show display booths blend custom features with lighter weight materials to lower your storage, transportation and drayage costs.